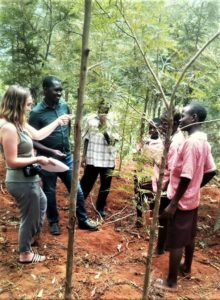 As Wales was hit by the Beast from the East, I was fortunate enough to be skipping off to much warmer climes in East Africa to visit some of our forest projects. The purpose of the trip was to meet project staff and beneficiaries to learn how the project is benefiting their community and environment, what the biggest challenges they face are and how Size can provide the most necessary and effective support possible. 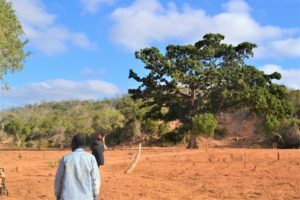 I visited WWF Kenya’s project in Eastern Kenya where they are protecting the coastal forestsand working to empower local communities to reduce their dependency on the forests resources. From there, I travelled inland to Boré to stay at the newly launched Boré Forest Community Centre. 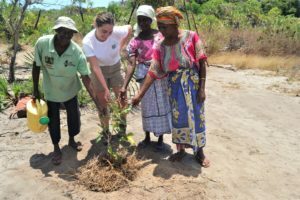 This project is implemented by Community Carbon Link – a project Size has funded in the past – the purpose of this leg of the trip was to learn how impactful and lasting our contribution has been. For the final leg of my trip I flew to Kampala and embarked on a 7 hour bumpy-as-you-like drive to Mbale in eastern Uganda which is the home of our 10 Million Treesproject. It really was such an amazing and valuable experience and I hope that I can do these amazing communities justice by communicating to you over the coming months insightful real-life stories with examples of the successes and challenges these communities face, in a bid to express just how vital the projects we fund are, not only to these communities but also to the wider-reaching issue of tackling climate change. Bukhuakhua School children in the forests they’ve planted on the school grounds, talking to Anna about tree planting and the environment. Uganda. I want to share with you some of the most striking lessons I learnt from my time in East Africa. The first thing that struck me was how warm the people are, I heard ‘Kenya is your second home!’ countless times. I met so many people with the same aspirations and wishes we have, who want to be able to provide for their families and give their children access to education. The key difference is that here we don’t have to struggle daily for our most basic needs or provisions such as water, or fuel for cooking or money for food as crops fail due to the warming climate. And the list goes on. The result is incredibly resourceful, resilient communities that are united in the face of adversity. 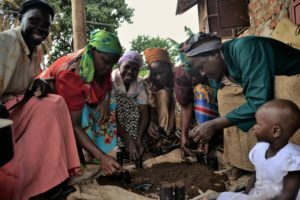 For example, a women’s tree planting group in Mbale, the Suunu Women, get together weekly to pool a portion of their incomes. As a group they decide what happens with the money. Either they give out small loans to people in need or claim their portion back as a lump sum at intervals, which makes paying large payments such as school fees or medical bills easier in what is typically a hand-to-mouth existence. Women weeding the seedlings at Bore Central Nursery. Bore, Kenya. Women walking home from a day working at the tree nursery. Bore, Kenya. I would like to elaborate on this point for a moment. Where entire communities survive real hardship, women certainly bear the brunt of this. It was International Women’s Day whilst I was in Uganda which is celebrated as a public holiday. However, rather than being a day to celebrate woman-kind and their struggles and achievements to fight gender inequality, it seems to be a day when men boast about taking over cooking duties…for one day. This just reinforces the stereotype that a woman’s place is in the kitchen. Women are responsible for cooking, caring for the family, keeping the home, fetching firewood and water (carrying 20 litres of water for miles in 36°c heat) and doing the majority of the laborious work like farming. It’s a difficult one to tackle as these gender roles are deeply engrained in these cultures and we certainly don’t want to be imposing our western frameworks of ‘normal’ onto them but if you keep in mind that women rights are human rights, and that empowered women equals empowered families and communities, then we must address this disparity. We will continue to ensure that where Size of Wales funding is put to use, every effort is made to address women’s rights and strive for gender equality. The Makunya Women preparing pots for the seedlings. Uganda. 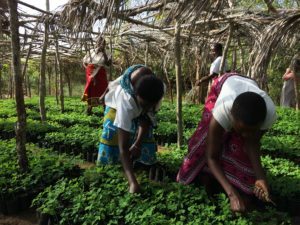 Makunya Women at the tree planting nursery. Uganda. I met with the Makunya women’s tree planting group whilst in Mbale. This wonderful group of women have a solid bond that is really moving and they were a complete joy to spend time with. 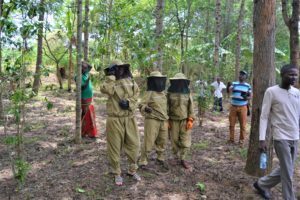 Together they have set up a tree planting nursery and become a big part of the solution to the environmental issues affecting their region. Through their involvement with the Ten Million Trees project, they also received training on installing fuel-efficient cook stoves. These stoves require up to 80% less firewood than traditional style stoves, directly reducing the pressure on the trees in the village. They have installed 20 among their community to date. 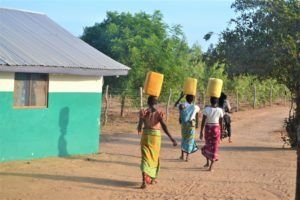 They are a wonderful example of empowered women, capably providing and caring for their community simultaneously. Onto education. Mmm. Somehow, among classes 88 strong, with very make-do furniture, and sometimes no furniture at all, the teachers I met were so enthusiastic about their jobs. They have a real sense of the worth in what they are doing despite the somewhat challenging set ups. Education is the absolute be all and end all and if future generations are educated and their talents and skills have room to grow and show, the future must be brighter. However, many families can’t afford to send their children to school and even if they do, a struggling child will find it hard to get the focused support they need. Many of the schools I visited also participate in tree planting activities and have healthy looking forests on the school grounds. These trees provide welcome shade and fruit for the children. They also teach valuable lessons about taking responsibility to care for your environment and by default the wider world. 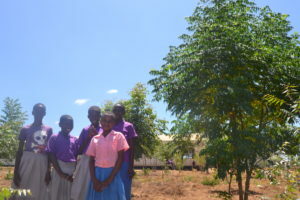 Pupils of Kakuhani School with their young forests. Bore, Kenya. 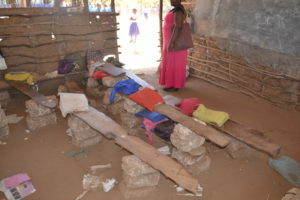 A class room desk and benches, made from wooden boards and stones. Bore, Kenya. I saw time and again the many, many benefits that ripple out when communities plant trees. 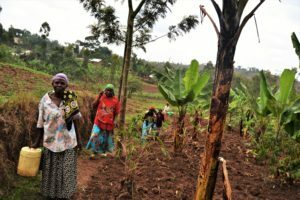 The 8 million trees that have been planted in Mbale have already helped to reregulate the rains, and farmers who have been trained in agro-forestry farming techniques can grow coffee, a wide variety of tropical fruits and keep bees in the trees with small honey selling businesses on relatively small plots. What’s more, with education, communities understand that fast growing, re-sprouting species are best for firewood; straight-growing hard wood species are ideal for use as timber and which trees provide important medicines and fruits and are therefore worth more standing. Tree planting initiatives also provide job opportunities as nursery bed operators for people such as Benzi, Mbuche and Fatuma [pictured] who work for Gogoni Conservation Group in Kwale County, Kenya and data clerks like Nuwa [pictured] from Mbale who track the progress of the trees that have been planted among the communities and ensure the recipients of the seedlings know where best to plant certain species and how to care for them. 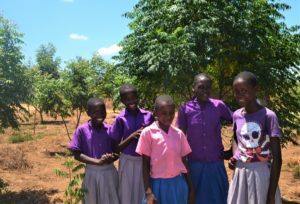 Benzi, Anna, Fatuma and Mbuche (L to R) with a mzambarau seedling. Kwale County, Kenya. 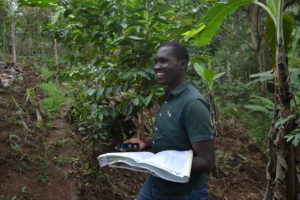 Nuwa, Ten Million Trees data clerk monitoring success of seedlings. Mbale, Uganda. Areas with high tree cover are also less likely to flood as the water runs off slower and the soil retains its nutrients creating more fertile soil. The roots of a tree make the soil more secure and landslides are much less likely to occur in these areas. They clean the air locally and cool the air globally. And they’re outright beautiful too. Planting trees is an all-round winner, trees are the key! Deforested land of the Giriama people. Bore, Kenya. In Boré, the Giriama people haven’t had a good harvest for 6 years due to a particularly long spell of drought. This is devastating for a farming community. They are left with no choice but to cut trees and make charcoal which only exacerbates the problem further. It’s easy to see how vulnerable communities can get stuck in a dangerous cycle. Extreme weather conditions caused by our warming planet damages infrastructure, the economy and in many cases their source of (already low) income. This means people need to rely on the land for survival, and unsustainable misuse of the land (e.g. charcoal burning or chopping trees for firewood or shelter for example) worsens weather conditions. This is why the majority of our projects take a two-fold approach: 1) to plant trees and protect those still standing 2) offer alternative streams of income that will reduce a community’s dependency on forests’ resources. Climate change negatively affects so many aspects of life. 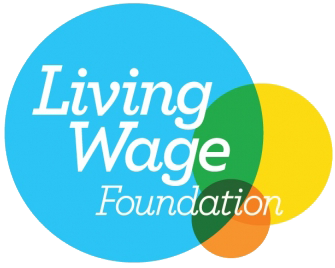 It is an all-encompassing issue and by tackling this, we can improve people’s quality of life, health, the economy, bringing resilience and cohesiveness to communities, improving their livelihoods and providing the necessary skills and capacity to develop an educated and empowered community for them and their future generations. I would like say a big thank you to Wales for Africa for funding the trip, to each of the 3 projects who were wonderful and generous hosts and to every person I met along the way who shared their story with me.